An inspirational collection of shamanic songs from around the world. The first natural healers were the shamans, and their most powerful medicine was supported by music. 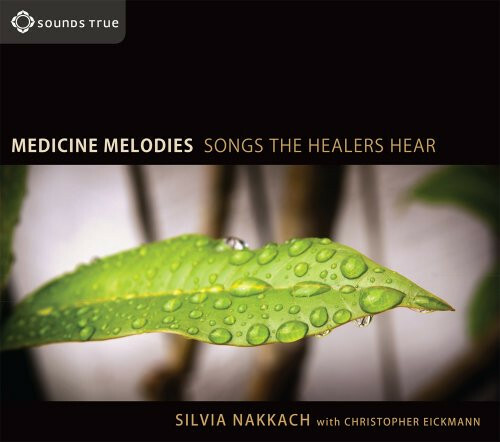 From time immemorial, explains musician and expert voice culturist Silvia Nakkach, the shaman has heard the hidden music of the universe and sung it back through what she calls “medicine melodies”: healing sound formulas that help to transform energy patterns and enhance deep listening and receptiveness. Joined by composer and multi-instrumentalist Christopher Eickmann, Silvia draws on Indian ragas, Sufi zhikrs, Tibetan chant, and indigenous shamanic songs from Africa and the Americas to offer Medicine Melodies, a multilayered tapestry of drones, vocal harmonies, strings, and acoustic landscapes. Review for Medicine Melodies Review by Geary S.
Love this! Highly recommend this album if you're at all interested in Sound Healing. Silvia has an amazing voice that infuses her songs with sacred healing. I love this album. Silvia's voice and the music that holds her take me away on a blissful journey from which I return centered and calmed. Thank you for this gem of an experience.